Crème brulées, though tasty by themselves, are a perfect palette for other flavors. My husband Lulu loves butterscotch, so I came to the fairly obvious conclusion that I should combine the two of them. If you're not a big fan of butterscotch, you can substitute any other flavor that you like but you have to balance the sweetness of the dessert. On the stove, fill up a sauce pan with the milk and cream, bring it to a boil. Remove from the heat right away and add the butterscotch morsels. Keep stirring until the butterscotch morsels are melted. Separately, whisk the egg yolks with the sugar in a mixing bowl until it becomes a pale yellow. Add the vanilla extract and combine the butterscotch liquid with the egg mixture by slowly adding a ladle of the milk mixture at a time to prevent the yolks from curdling. Strain through a fine mesh to make sure there are no chunks of butterscotch morsels left. 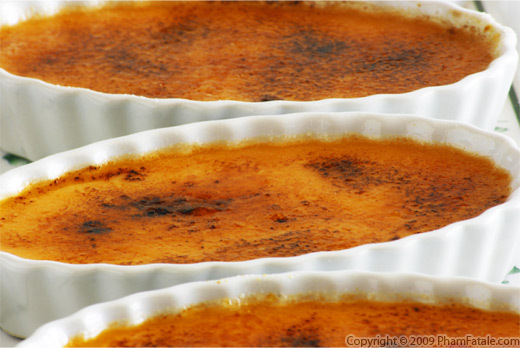 Fill up 4 large crème brulée ramekins with the mixture. I used oval creme brulee ramekins. 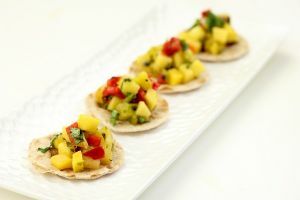 Place them in a warm water bath in a deep baking pan. The water should go half way up the side of the ramekins. Cover the dish with a sheet of aluminum foil and place in the oven for 35-40 minutes. Allow the crèmes brulées to cool completely first, then plastic-wrap each individual ramekin and chill in the refrigerator for at least 3 hours. 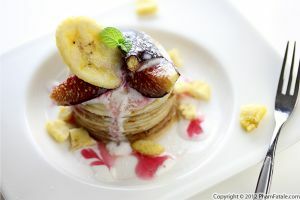 The fat from the cream may pick up some other odors from the refrigerator if the cups are not sealed properly. 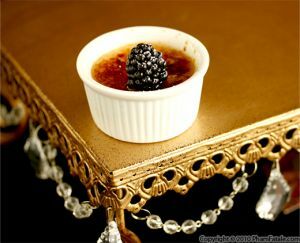 When serving, sprinkle about a teaspoon of sugar in each of the ramekins, then caramelize with a blow torch. While waiting for the cream and milk to boil, you have to be very careful. Don't go anywhere else. If the phone rings or someone's at the door, let it go. You really have to focus until the cream and milk is hot, otherwise you'll be cleaning your stove and scraping off burnt milk all night long! As soon as some bubbles come up, turn off the heat and immediately add to the butterscotch morsels. While letting the butterscotch steep in the dairy mixture, it's preferable to stir the mixture until the liquid is smooth rather than whisking, to create as little milk froth as possible. You don't want a latte foam to form. If you don't own a blow torch, put the ramekins under the broiler of the oven until the sugar caramelizes. 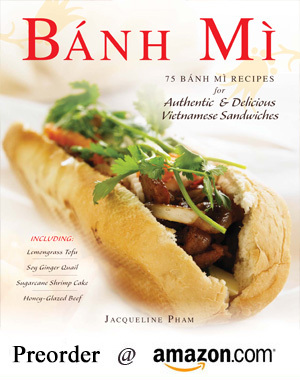 Published By: Jacqueline Pham on May 17, 2009. I love butterscotch and it's not always easy to find desserts that incorporate it. Thanks for posting this. I'm going to try and powder some butterscotch candies on top of the custard and "brulee" it! I just read your article in the Merc. Love your recipes. All I have to say is YUM! 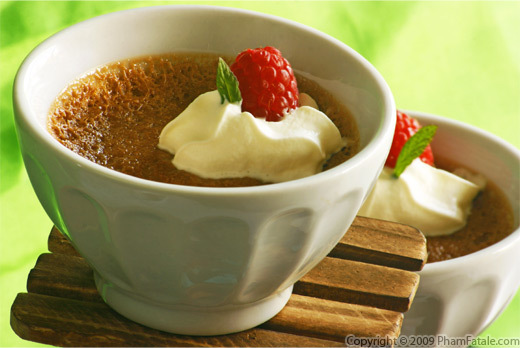 I love creme brulee, and I'm with Lulu: butterscotch is awesome. So, putting the two together is genius. What a fabulous job! WOW! I love your tip too. There is only one word for it: Yum! I love this crème bruléé!! 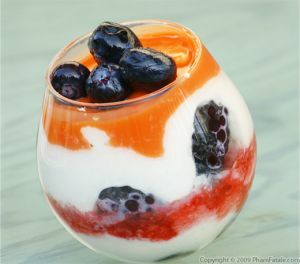 This dessert looks fabulous, Jackie!! I would totally want to dig in 1 right now,....Please? 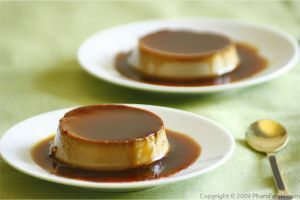 My husband enjoys Filipino leche flan but it can't take the place of creme brulee which is his absolute favorite dessert! I need to buy a small blowtorch - my mother-in-law and I once tried to caramelize the sugar as you suggested, under the broiler, but the end result didn't come close to that nice candy-like texture. 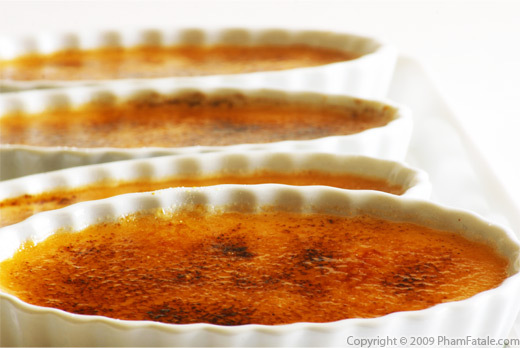 Butterscotch creme brulee sound so good!